could be a jacket? look at those fingertips, can't be Kylo. As for the Death Star scene... The 2nd Death Star wasn't fully completed then had its main reactor blow then detonated yet a decent piece survived all that plus re-entry ? Not to forget the Emperor's tower surviving all that. 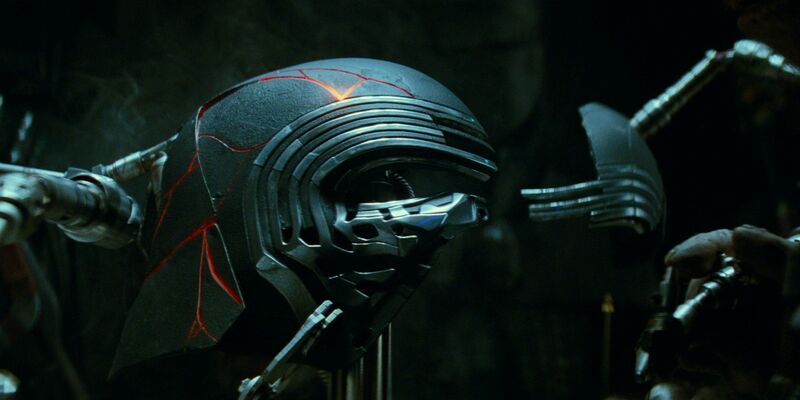 The helmets of the other Knights of Ren don't look like that. It's Kylo's helmet getting fixed by hairy creature. I kinda have the feeling that his helmet gets fixed without his permission though. I also thought it's the first Death Star, but this one blew up completely. Furthermore for Palaptine's return it would make much more sense to have the second Death Star. I'm just saying Lord Momin and the Vader comics. excuse the horrid snip, but this was the view from DS2 as the falcon flew out before it blew up..
Why would there be wreckage to begin with? It's not like it sunk. It blew up like fireworks. the big explosion was visually epic at the end of ROTJ.. but with anything blowing up - there is always wreckage. My impression is that the DS1 blow-up completely, a total annihilation, at least visually it seemed to indicate that. As for DS2's destruction, the visuals were a bit different and showed a bit of "section" destruction, with an initial flare inside (internal explosion) and then a major explosion and you can see a few debris falling. The fragments of the DS wouldn't be seen in space after that blinding flash, pus some of those fireballs are parts of the DS. There is plenty of footage of cars exploding on mythbusters and large twisted fragments always remain. This is Star Wars. Pieces of DS-1 are used in canon to build a new space station where Alderaan used to be. Death Stars were built somewhere. Pieces get moved. Skylab. All kinds of things in universe and out of universe. There's no sound in space, but it's Star Wars. Joking aside. Kylo is just hitting this pure fellow with his cross-guard saber, the main blade is just brushes him. Will the red marks stay red or is it just the heat? I sure hope so that they stay this way because it looks menacing. Exactly, even more reason then why its not vaporised as others assume from the footage of ANH and RotJ. The Death Star blew up Alderaan and there were chunks of the planet everywhere making Han think it was an asteroid field. The DS explosions you are seeing are the gases on fire but there would be wreckage once the area surrounding the DS stopped burning. Wow, the hand there looks a lot more like Snoke's than the other shots. Hi. Just a reminder that trailers these days are cut with one goal being misdirection. Basic stuff is obvious, like the fact the TIE is NOT Kylo's Silencer, but instead has a standard round fuselage and looks more like a FO special forces INterceptor, which we've sort of seen in the Resistance animated show. Maybe Kylo is flying it? Who knows, at this point? I just find it funny that some folks are doubling down SO HARD on a shot that lasts a half second (like the alleged Republic Cruiser), when the movie is coming out in 8 months and will show us in great detail what is actually in the shot. Enjoy the speculative fun and let it fire up your imagination, for sure, but be realistic about what we've gotten. It's a teaser. That's all. It's likely at least some of that footage won't even be in the final cut of the film, anyway!